American Holly has the most pure white color of any wood in the world. It is very hard to dry properly without cracking and must be harvested in the dead of winter or the wood will be spalted (stained) with a blue-grey fungus. This process makes American Holly quite expensive. Add to that the fact that it is a nightmare to keep from shifting in board form, and it’s easy to see why only the most meticulate artisans work with this wood. 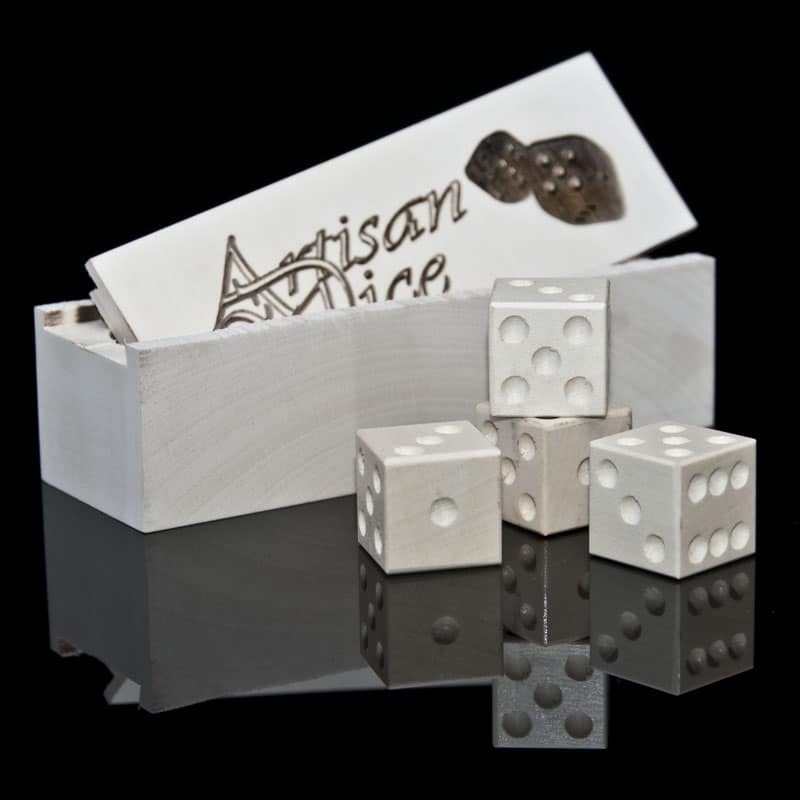 American Holly makes uniquely striking dice due to its almost non-existent grain pattern and nearly pure white coloration. American Holly takes laser engraving very well, so the markings on laser-engraved dice are highly legible. NOTE: The American Holly box is for display purposes only. Dice will arrive in our standard dice box. Could you post a picture of the dXX dice? I’d love to see what they look like with the engraving before purchasing. will try to get a set finished before the kickstarter ends, but we have a ton of others in front of it so no promises. Must get a fudge set of these. It’d be a perfect match for my ABO fudge set. 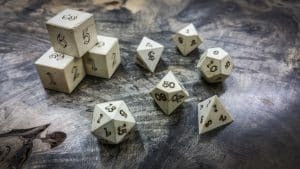 Does the fungus destroy the wood, or could you make white/blue grey marbled dice from it? it just stains the wood. Hi, I am interested in your dice, though I am not sure how I can look at prices and or purchase? I don’t see an option for it. Can you help? american holly was available on the kick starter and will be added to the web site shortly. you will see the check out options then. I would like to get a set of these in d10s. How much extra would it cost to get the box made of the same wood? Thanks! Hey Rachel, unfortunately American Holly that thick and long would be quite expensive, for a polyhedral size box you’d end paying about $150. agreed. my supplier of American holly is out of the 2 inch thick material we’d need to make boxes, and the one other supplier I can get American holly from is extremely proud of their stock. hello, you can send in Italy? 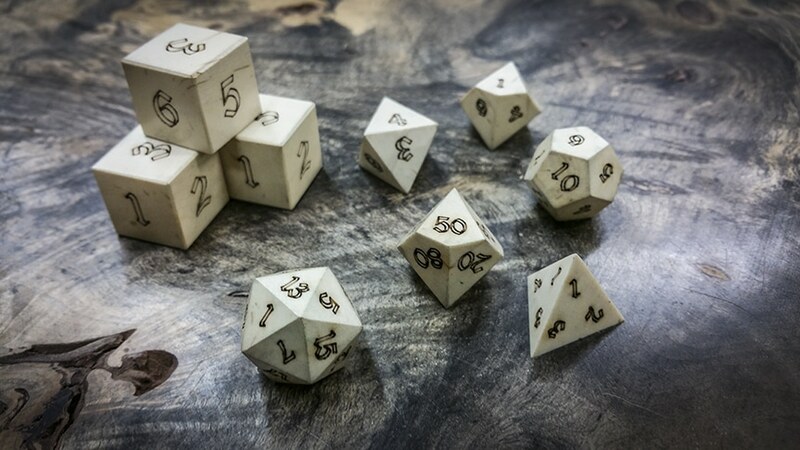 I was considering buying a set of polyhedral dice from you all and I really like that American Holly, about how long would it take to recieve a set if ordered within the week?